MASTER PROBLEMS Work and Leisure How to prevent dry rot on your wooden house? How to prevent dry rot on your wooden house? During late summer or autumn, it may quite unexpectedly invade your wooden house or storehouse. It prefers to live in wooden houses, especially older ones without cellars. A fungus, Merulius lacrymans, which normally causes dry rot. Lacking chlorophyll, this fungus must get its nourishment from other matter—for example, from wood, hardboard, cork matting, linoleum and the like. Left undisturbed, the body forms films and strings. With these strings, the fungus can force its way through mortar and cracks in cement. inside wall or on a ceiling. This “fruiting body” may measure as much as .3 meter (12 inches) in diameter. In the pores of its surface, brown or reddish spores form. Each square millimeter of the pore-covered surface can produce up to seventy-five spores per minute. Each spore has the capacity to grow into another fungus plant and can, in turn, destroy unlimited amounts of wood. The spores are sticky and can fasten themselves anywhere. If there is sufficient humidity and warmth, they grow very quickly. But the spores cannot attack fresh, dry wood. This fungus cannot live in open air, it being too dry there. The high humidity that is required for this fungus to thrive is found only in an insufficiently ventilated damp place. The fungus stops growing when it becomes too dry, but it can start up again as soon as it becomes damp. Once it has grown sufficiently, it itself can give off the dampness required for continued growth. The growth rate of this fungus is affected by the temperature. To grow, it must have a temperature of at least 38 degrees Fahrenheit (3 degrees Celsius) but it does best at 65 degrees to 73 degrees Fahrenheit (18 degrees to 23 degrees Celsius). When the temperature rises above 79 degrees Fahrenheit (26 degrees Celsius), growth is sluggish. At 68 degrees Fahrenheit (20 degrees Celsius), the growth rate is three times as fast as at 50 degrees Fahrenheit (10 degrees Celsius). How can you determine whether this fungus has made itself at home in your house? You may spot a spore-producing “flower” somewhere—on the cellar ceiling, under the washbasin, on a floor. You may see mycelium roses on the floor or on an inner wall. Or, there may be a musty, mushroomlike smell. When that is the case, you may need professional help. It may be necessary to break up a floor or a wall and to remove everything on which the fungus has settled or which gives off its odor. Thereafter, everything may need to be sprayed with a poisonous fluid, to kill the spores and whatever else is left of the fungus. 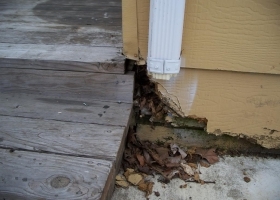 To make sure that this fungus does not get a foothold, good ventilation is needed under the house all year round. Moving dry air is deadly to the fungus. Often it will die at a temperature of 22 degrees Fahrenheit (−6 degrees Celsius). Another thing to watch is leaks in the roof. Water should not be allowed to run down the wall to the floor near the foundation. If water has flooded any room, the floor and the insulation should be permitted to dry out thoroughly before putting back a thick mat that prevents drying. Pipes under the washbasin, toilet and bathtub should fit well so that water does not leak down through the floor. If you suspect that the load-carrying beams of floorboards within the foundation are rotten, or if there is a musty smell in a room, you could spray under the floor with a rot-protection fluid. Some homeowners use garden sprayers and extension tubes for this purpose; others use plastic sprayers that can be pressurized after being filled with the fluid. They insert the tube through a ventilation opening and spray the floor of a room from below. In this way, they get a fresh smell in the whole house and protect their flooring from rot. Also, for protection against fungus, the walls and ceiling in the cellar could be coated with lime. So while Merulius lacrymans is indeed an undesirable invader, there are ways to keep this fungus from gaining a foothold in your house.